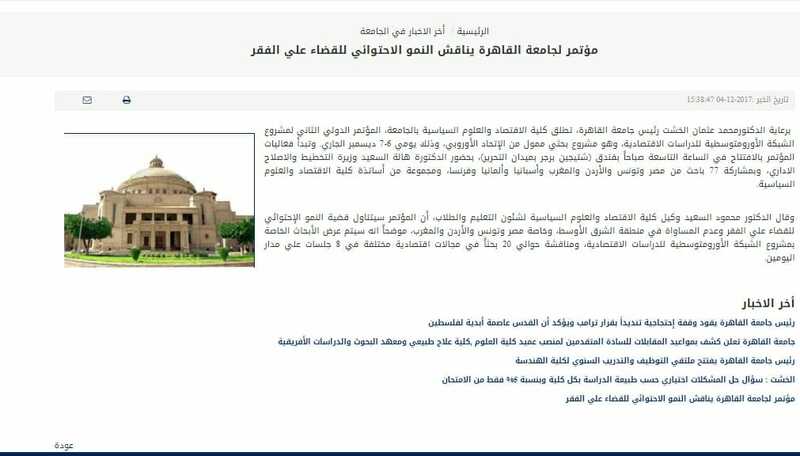 Several major news portals in Egypt announced the second annual Conference of EMNES with the participation of 77 researchers from Egypt, Tunisia, Jordan, Morocco, Spain, Germany and France, and a group of professors from the Faculty of Economics and Political Science. The related articles highlighted the presence of H.E. Hala El-Said, Minister of Planning, Monitoring and Administrative Reform of Egypt and of the Vice Dean of Faculty of Economics and Political Science of Cairo University, Mahmoud El Said. Furthermore, the articles underlined that EMNES is an EU funded project and that the aim of the conference is to discuss the issue of growth in the region and how to eliminate poverty and inequality in the Middle East, especially Egypt, Tunisia, Jordan and Morocco.